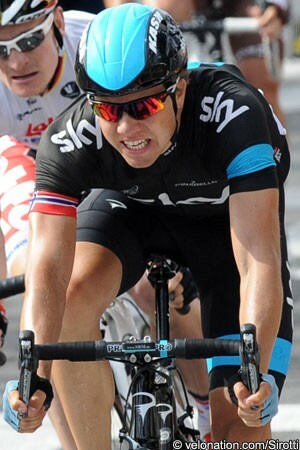 Edvald Boasson Hagen (Team Sky) is out of the 2013 Tour de France after fracturing his right shoulder in the mass pile up at the end of stage twelve into Tours, Team Sky has confirmed . The former Norwegian champion was among the fallers as a crash hit the front of the peloton with just under three kilometres to go, and crossed the line nursing his shoulder several minutes behind Marcel Kittel’s (Argos-Shimano) victorious sprint. The extent of Boasson Hagen’s injuries were unclear in the stage’s immediate aftermath, as Maillot Jaune Chris Froome explained. “I don’t know much at the moment, only that Edvald Boasson Hagen went down, probably 2km from the finish in a pile-up there,” Froome said. “He came in holding his shoulder and I think he’s in pain with that and with the doctors now getting it checked out. After visiting the Tour’s mobile x-ray unit, however, worst suspicions were confirmed: that Boasson Hagen had fractured his shoulder in the crashand he will not start the thirteenth stage tomorrow, reducing the nine-man Sky Procycling team to just seven. "After the crash Edvald was taken to a local medical centre for x-rays which revealed he had a fracture of his right scapula," Sky Procycling doctor Alan Farrell confirmed on the team's website. "Fortunately this doesn’t require surgery but Edvald will return home to Norway for further investigation and treatment and we look forward to seeing him racing again sometime over the summer." Team Sky lost Vasil Kiryienka on stage nine to Bagnères-de-Bigorre, as the Belarusian powerhouse reached the finish outside the time limit after working hard to keep a struggling Richie Porte in contention. Although yesterday’s time trial performance indicates that Porte has recovered from what may just have been a jour sans, Geraint Thomas continues to ride with the fractured pelvis that he sustained in the crash on stage one, while Peter Kennaugh’s condition is uncertain after coming down early in the Bagnères-de-Bigorre stage. The British team may be forced to take on the challenge from Froome’s rivals with just five fully fit riders, but Sky will continue as before, according to team principal Dave Brailsford. "It’s never nice to lose a rider of Edvald’s ability, but ultimately we’re still confident that with the riders we’ve got left we can pull together and see the race through," Brailsford said. "The plan doesn't change and we will do everything we can to support Chris."